The Nashville Predators have swept the Chicago Blackhawks in the first round of the 2017 Stanley Cup Playoffs. No, that’s not a misprint. 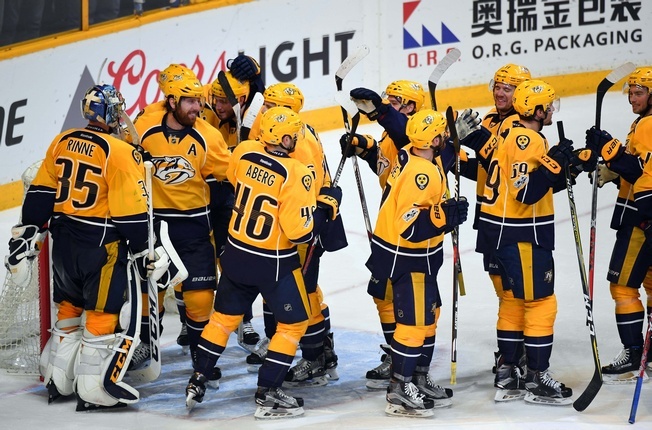 The Predators took the series home with a 4-1 victory in Game Four on Thursday night, with goals from Roman Josi, Colton Sissons and Viktor Arvidsson. Chicago’s lone goal came from Jonathan Toews. Few expected the upstart Predators to knock off the top-seeded Blackhawks, especially given the run-of-the-mill season Nashville pulled through to earn the second wild card spot in the Western Conference. And Chicago had the experience edge, too, which worked out well for the Pittsburgh Penguins against the Columbus Blue Jackets. But the Predators proved that experience isn’t everything. The series opened with back-to-back shutouts and things didn’t get much better from there for the Blackhawks. In the end, Chicago only scored three goals in the entire series and the Predators waltzed away by outscoring their opponents 13-3. Again, that’s not a misprint. Nashville kept most of the Blackhawks off the board, with Toews only collecting one goal and a total of two points. Patrick Kane had just one goal in the series and registered an assist in Game Four, while Dennis Rasmussen had the other goal for Chicago. The Blackhawks went from scoring 244 goals in the regular season to mustering nothing in the off-season. This marks the first sweep of the Blackhawks since 1993 and perhaps the first time Chicago’s been so resoundingly embarrassed in the post-season in the modern era. There will be a lot of analysis to come in the series and everyone will have their opinions on how and why this happened, but the Blackhawks have got to be stunned. They knew the Predators would come to play, but imagining a smackdown of this magnitude must be difficult for even the most ardent sports fans. Did speed kill the Blackhawks? At times, it certainly looked that way. The Predators were younger, quicker and more aggressive after all. They won more puck battles and knocked Chicago back to a chip-and-chase brand of hockey that didn’t allow their scorers to get in position. And due to an aggressive forecheck, the likes of Marian Hossa and Artemi Panarin were kept off the scoreboard. And in a sense, maybe there was less between these two teams than many thought. Our own analysis turned up less than a hair’s difference in offence, with the Predators actually more diverse in terms of finding goal-scoring. That weighed heavily against Chicago in the series, as did the play of Rinne for Nashville. There are many questions and perhaps many answers, but for now the Blackhawks will try to figure out what went wrong. And the Predators will prepare for the second round.